The Samsung Galaxy S4 is finally here, and having already compared the device against the HTC One and iPhone 5, we’re back with another face-off. This time, the new handset will be pitting its wits against two devices which have been presented with the mammoth task of rejuvenating the fortunes of two once-mighty brands in the mobile industry. Both Nokia and BlackBerry have enjoyed vast successes over the past decade, but as both have struggled in the wake of iOS and Android, the Nokia Lumia 920 on Windows Phone 8, and the BlackBerry Z10 on the BB10 OS, have some real ground to make up if they are to compete with the Galaxy S4. Here, we compare them with yet another like-for-like table of the vital specifications. 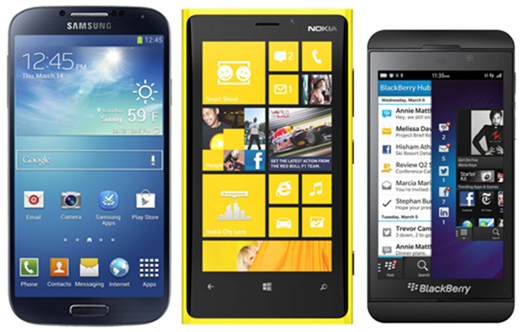 As you can see, the BlackBerry Z10 and Lumia 920 are not too dissimilar in terms of their processor and graphics power. In fact, they’re identical. The Qualcomm Snapdragon dual-core 1.5GHz Krait, allied to the Adreno 225 GPU, is a feature of both, and the differences from then on are relatively few and far between. The Galaxy S4 sees Samsung deploy its wealth of experience, knowledge and research of the modern smartphone market, and as you would expect, smokes its Nokia and BlackBerry rivals in nearly every department. All the way from the 5-inch HD Super AMOLED display, which is around 100ppi sharper than either the Lumia or the Z10, to the 750,000 apps available courtesy of the Google Play Store (App World and WP Store muster a little over 200,000 collectively), the Galaxy S4 is inarguably superior. As demonstrated just a short while ago, the Galaxy S4 is also incredibly fast, but with both the Z10 and Lumia 920 also proven to offer a relatively seamless user experience, it’s worth pointing out that whichever of these three devices you choose, you can expect very little in the way of lag. The high-end user will undoubtedly go for the Galaxy in this particular battle, but with BlackBerry 10 now looking the real deal in terms of being a truly competitive OS, and the Nokia Lumia 920’s 8.7-megapixel PureView still offering an A-grade shooting experience, the two underdogs still look to have plenty of fight left in them.